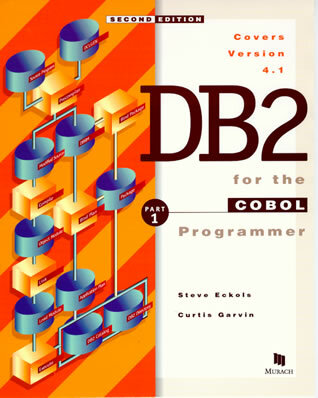 This is the one DB2 book that focuses on what COBOL programmers…not DBAs…need to know. As a result, it works well for instructors who are training students for DB2 programming jobs in their region. And, yes, it will outperform any training materials that are available from IBM. Although this edition of the book was published in 1999, trainers at mainframe shops tell us that DB2 programming is still being done the way it’s presented in this book. One reason for this is 70% or more of the programming in a mainframe shop is maintenance programming on “legacy” applications. Another reason is that IBM has always prided itself on the upward-compatibility of its software, so the code that worked in 1999 still works today. Incidentally, this is the first mainframe book we developed with our “paired pages” format. It is also one of the last books that we published before we went to blue covers with Murach’s as part of the title. But if you’ve ever adopted any of our Murach’s books, you can count on this book to deliver the same level of practical, example-packed information…even though the cover is different! "I just wanted to say that DB2 for the COBOL Programmer, Part 1 is one of the most helpful programming books I have ever bought. I was starting a new job, and although I had plenty of COBOL experience, I had no DB2 experience. With this book, I was ready-to-go in 2 days." DB2 is the primary database management system (DBMS) for IBM mainframe computers that run under the z/OS operating system and its predecessors. Although you can use several different methods to work with DB2 databases, most DB2 work is done through COBOL programs. The goal of this book is to show how to develop and maintain those COBOL/DB2 programs. Chapters 1 and 2 show how to retrieve data from a single DB2 table. Chapter 3 shows how to add rows to, delete rows from, and update rows in a single table. Chapter 4 shows how to retrieve data from two or more related tables at the same time by using unions and joins. When your students complete this section, they’ll be able to write production COBOL programs. Chapter 6 shows how to use the column functions to summarize or average the data in one column of a table. Chapter 8 shows how to work with variable-length columns and nulls. Chapter 11 shows how to maximize locking efficiency so your programs don’t tie up the system. In this section, each chapter is written as an independent unit, so you can assign these chapters in whatever sequence you prefer. You can assign the chapters in this section any time after your students complete chapter 1. When your students complete section 1 of this book…just 142 pages…they’ll be developing COBOL programs that access, add, delete, or update the data in one or more DB2 tables. What’s more, they’ll understand how DB2 works. This book presents 12 complete COBOL programs that work with DB2 databases. These programs show how the DB2 code is coordinated with the COBOL code. If you offer mainframe programming courses in your curriculum, this book can be used for a complete course in DB2 programming. It can also be used as an information-only supplement to a COBOL programming course to show how DB2 is integrated with COBOL in a COBOL/DB2 program on a mainframe. Since COBOL/DB2 applications run on IBM mainframes, this book is best used in curricula that provide free access to an IBM mainframe. Then, your students can compile and test their exercises and projects on that mainframe. If your school doesn’t have access to an IBM mainframe, you can use this book to teach DB2 programming as an information-only course. Then, you won’t need a computer lab at all. This can work in conjunction with a COBOL course when you just want your students to know what’s different about DB2 programming and where it fits in the IT job market. DB2 for the COBOL Programmer, Part 1 (2nd Ed.) is currently in its second printing. Since that printing, errors were discovered in the programs in chapters 2 and 3. Those errors are described below. The number on the right of this sequence tells which printing your book is. In this example, it's in the second printing. If you find any other errors, please email us so we can correct them in the next printing of the book. Thank you!